This is a deception based on a verbal ruse which may not work all the time. Have you ever wanted to create the illusion of being able to hypnotize someone to lose the ability to write? Well, this method does exactly that, and it is super simple. 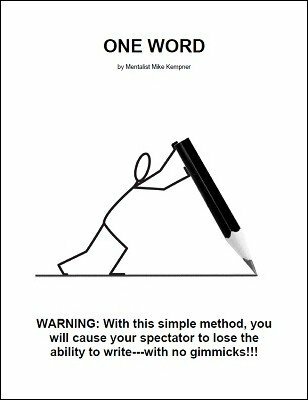 Even if your spectator is a Harvard PhD in English, she will not be able to write one word on the paper. She won't even be able to put the pencil on the paper - her brain will simply refuse to process information - welcome, to One Word . This method has nothing to do with the paper, nothing to do with the pencil or pen, and everything to do with your mental manipulation of the spectator's brain. You tell your spectator (not a stooge, can be anybody) that you have an ability to make her brain freeze so that she cannot process any information. You tell her that you have a piece of paper and that you are going to give her some simple instructions to write something. You tell her you are going to write down these instructions on both sides of the paper, and then you give her the paper. She reads your instructions and you tell her that once she erases what you wrote, it will erase her memory. She erases what you wrote, and you instruct her to write one word. Even though you literally scream in her ear, "Write one word" plenty of times, she will not have the mental capacity to do so. You can tell her, "write one word", "please, write one word", "I demand you to write one word", and she still won't be able to do it. 1st edition 2016, 2 pages.